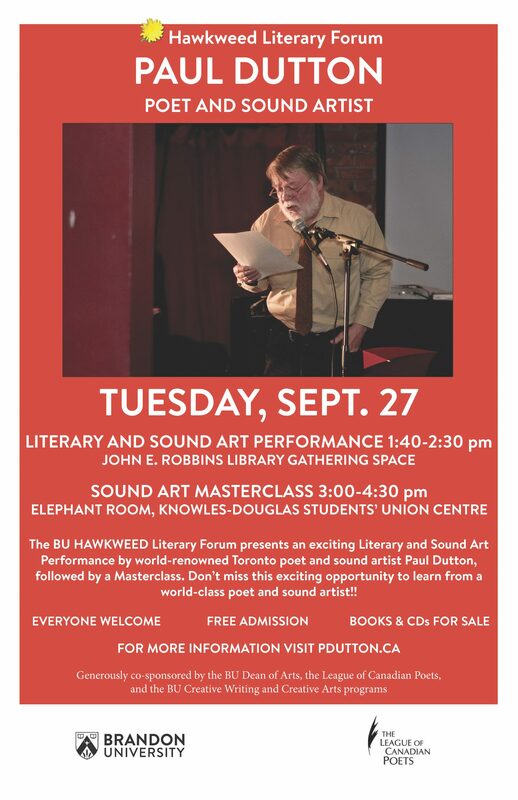 The Brandon University (BU) Hawkweed Literary Forum presents an exciting Literary and Sound Art Performance by world renowned Toronto poet and sound artist Paul Dutton on Tuesday, Sept. 27. Following his performance, Dutton will give a sound art masterclass. Dutton’s performance will take place from 1:40 to 2:30 p.m., in the John E. Robbins Library Gathering Space at BU. 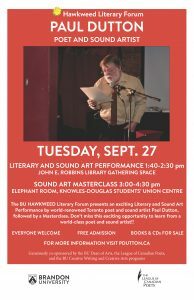 The masterclass will take place from 3 to 4:30 p.m., at the Elephant Room in the Knowles-Douglas Students’ Union Centre. Everyone is welcome to attend these free events. Books and CDs will be for sale. For more information, visit pdutton.ca. These events are generously co-sponsored by the BU Dean of Arts, the League of Canadian Poets, the BU Creative Writing and Creative Arts programs and the John E. Robbins Library.